I will tell you personal incident. I came from the hot state of Andhra Pradesh. As Bangalore is very cold, I soon developed sinus problem. I took a water heater and went for my bath. I sat in the darshan, Slowly, came the gentlle figure, the short with broad smile, holdin his robe with one, and weaving the hand in circles with the other. He stood in front of me looked into the empty space and waved both hands, saying, “There are some who come for darshan without having bath”. I, WAS WONDER STRUCK. I WAS TAKEN BACK, AND SAID, “How so you know?” He replied, “Where am I? I am in your bed room and I AM in your bath room. I am everywhere” Then I, ran to my room and took a double bath. I returned and sat on the verandah. Baba came suddenly after bhajans. He came straight to me and said, “A normal bath is enough, don’t worry”. The omnipotence and omnipresence are qualities of divinity to let us know that the Avatar is not less than the divine personaliy. Once Bhagavan said to an old man, “Today is the death anniversary of your wife.” Bhagavan even told him more details. He may have met so many people in between. Yet He remebers everything and everyone. Omnipotence, Omnipresence and omniscience. The person may have forgotten but not Bhagavan. Once there was a couple who came to Him. The couple had been having heated argument back at home. Bhagavan called the wife, and naturally the husband followed obediently. Both of them were given an interview. Then Swami came out of the interview room and said, “You fight at home, so fight here also, I will give you time.” So, here you can experience directly the omnipresence, omnipotence and omniscience. Once in KodaiKanal I was with all the seve dal in the garden. They were giving ice creams, so I also received one. Swami came to the mandir and I stretched out my hand. Swami said, “You have taken icecream already outside.” I said, “Swami, I did not say I have not eaten.” Then Swami said why do you stretch your hand here? “There, the seva dal give you icecream”. Then I said , But Swami I want from your divine hands, therefore I am asking. Then He gave me one with His divine Hands. He then asked me “Is it nice? OK, take two.” So this kind of omnipresence will make you happy and it will be benefical to you. Being exemplary in the society following the ideals to perfection is the best thing a devotee can offer to God returning with gratitude. 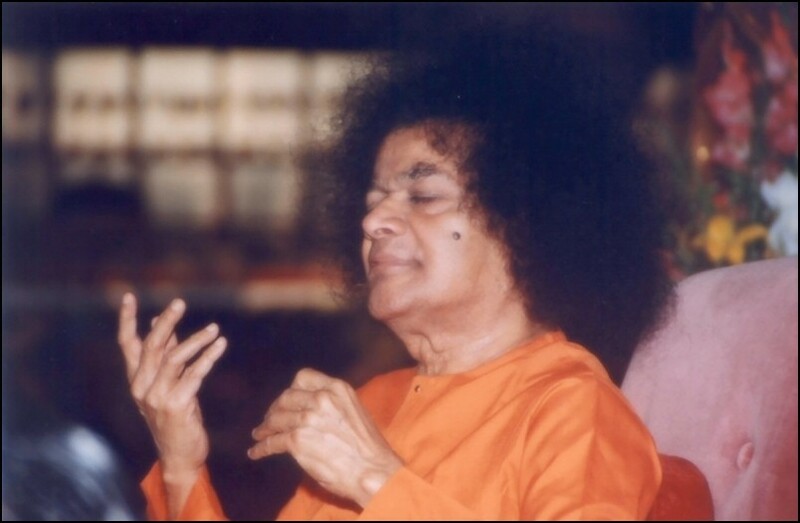 Bhagawan says, “My Life is My Message” and He does it to perfection by practising what He preaches. Dr. Adivi Reddy chronicled some of such incidents from the life of Bhagawan depicting how He would guide devotees who strayed from the path of morality and righteousness. Extracted from the June, 1989 issue of Sanathana Sarathi. A group of Sai devotees once requested Bhagawan Sri Sathya Sai Baba to inaugurate a new temple in their town. But Bhagawan refused to comply with their request on the ground that black market cement was used for constructing the temple. When the devotees pleaded not guilty, Bhagawan revealed to them that the so called Sai devotee who had donated some cement bags for the construction of the temple had illegally saved them from out of the cement allotted to him as a contractor for constructing a dam. Hence Bhagawan’s refusal. A Vedic scholar was asked by Bhagawan to get out of His presence when he was seated in the midst of some students and other devotees at Whitefield. When the pundit showed signs of bewilderment as to why Bhagawan was so harsh to him, he admonished the latter, saying that it was a crime for a Vedic pundit to profess to be a Sai devotee and at the same time to indulge in illegal malpractices by way of lending money to poor and illiterate villagers without proper licence from the Government, and that too, at exhorbitant rates of interest. The third incident relates to a Commercial Tax Officer in Orissa, who once made use of his official jeep to take his family and a few neighbours to visit a cave temple of Shiva in the interior of a dense forest on a 3000 feet high mountain. On their way back the jeep got stuck in a hill stream and refused to budge an inch. The dark night was gathering fast. An hour’s struggle to extricate the jeep was in vain. The officer was terribly scared, because the jungle was known to be infested with wild animals as well as dacoits, and his party consisted mostly of women and children. Being a Sai devotee, he fervently prayed to Bhagavan in utter desperation. Lo and behold! There appeared on the spot four Sathya Sai Seva Dal volunteers who rescued the party by pulling out the jeep, and then vanished in a second. Thus by Bhagawan’s grace, the officer and the party reached home safely. However, Bhagawan taught him a lesson not to misuse the Government vehicle for private purposes, by immobilising his jeep and thereby creating panic in him and his party. About a decade ago, a recluse of forty-five summers by name Kalpagiri came to Prasanthi Nilayam. No one could guess that this so called “monk” was a wolf in the garb of a sheep. Four years earlier, he committed a ghastly murder and to escape from punishment by the due process of law, he made good his escape by donning the saffron robe and wandering in the Himalayas and other places of pilgrimage. 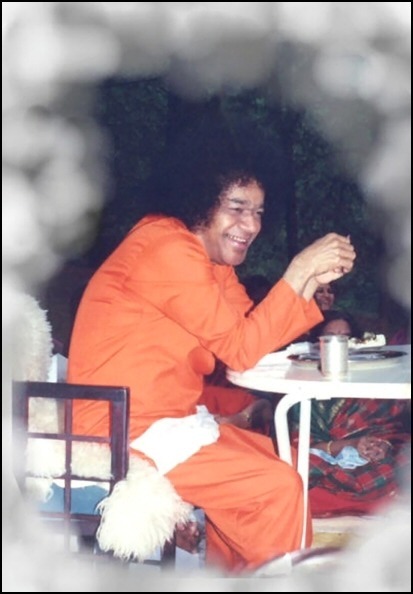 As soon as the Omniscient Sathya Sai Baba saw Kalpagiri in the Darshan line, He called him inside and told him during the interview: “My dear Kalpagiri! How can the saffron robe or visits to Rhishikesh and other holy places rid you of the sin of murder? Enough of your roaming in the guise of a Sanyasi for the last four years. Go now to the Police station and surrender yourself there. Experience your Karma by receiving the punishment due to you according to the laws of the land. When the death sentence is declared, file your clemency petition to the President. I will save you. You will not be hanged. You have my protection to atone for your heinous sin, through devotion, in this very birth. Come on, this sacred saffron robe does not befit you. Take this white cloth.” Saying so in a tone that combined love and sternness, Bhagawan gave Kalpagiri a white dhoti. Accordingly, Kalpagiri surrendered himself to the Police. The case was taken up. Though he confessed his guilt, the judge awarded him the capital punishment, as the crime was of a heinous nature. In line with Bhagavan’s direction, a clemency petition was submitted to the President of the Indian Union. Eventually, Kalpagiri received the President’s pardon. Death sentence was commuted to life imprisonment and Kalpagiri became an ardent devotee of Bhagawan, spreading his beneficial influence on the other convicts too. In conclusion, it may be seen from what is stated above that where there is a will, there is a way either to scrupulously abide by the Governmental rules and regulations or to violate them for selfish reasons. Bhagawan’s stand on this is extremely clear. Prof. Abdul Razaak Banurao Korbu was a reputed teacher of Law whose desire to teach in Bhagawan’s institute as a visiting professor was fulfilled by Bhagawan Sri Sathya Sai Baba Himself by handpicking his application form from a heap of applications. Startled at Bhagawan’s revelation, Prof. Korbu instantly understood that this had been a question mark in his mind for almost five years. “Forgive me, Baba. What You have said is correct” was the Professor’s reply. As he gaped at His palm, within a few seconds, the skin in the centre of the palm opened out and he could see a round large object coming out of it. Soon the skin became normal as before and there was a shining ring, which dropped on the floor. Surprised, he looked at the disfigured fingers of his right hand. 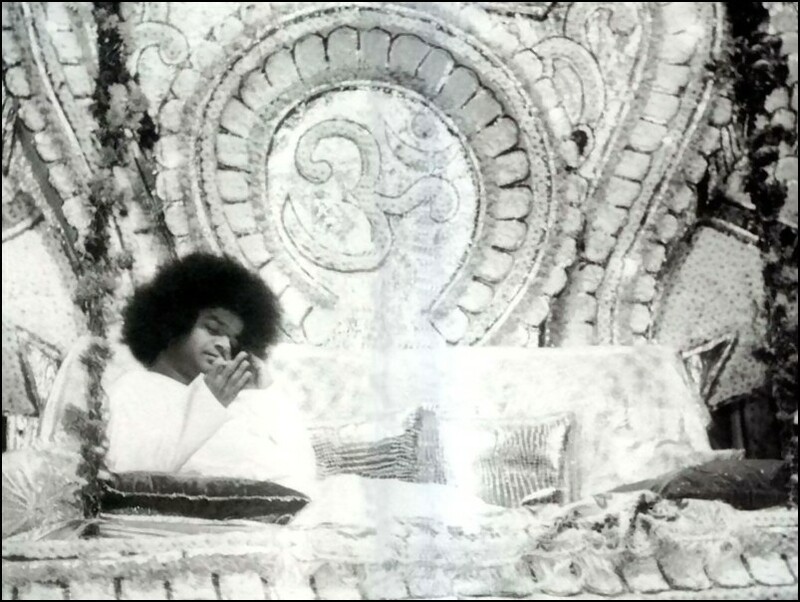 Bhagawan slipped the heavy shining ring on his finger; it was a perfect fit. Only after coming out of the mandir, the professor came to know from an American Muslim devotee, who had a look at the ring, that the word ‘Allah’ was inscribed in Arabic language, at the centre of the green emerald stone! This evening, the Tamil Nadu Balvikas children were to perform a dance drama in Sai Kulwant Hall. Bhagawan arrived for darshan in His chair at 5.20 pm, and after His darshan round, went into the interview room. From there, He emerged to come onstage and start the drama at 5.45 pm. After the 70 minute drama, Swami came down from the stage and blessed the children with group photographs. Prasadam was distributed, and Swami accepted Arati at 7 o’clock before returning to His residence. Bhagawan blessed the overflowing Sai Kulwant Hall in a white robe this morning, as the 83rd year of His advent dawned. The procession to Sai Kulwant Hall began from Yajur Mandir at 9.45 am, led by the bands of the Primary School, the Anantapur campus and the Prasanthi Nilayam campus, with Vedam chanting students from the Primary School, Higher Secondary School and the University. Bhagawan was seated on a raised chair covered with golden cloth. Once Swami reached the stage, He heard the four bands perform ‘Happy Birthday’ and other tunes before moving to the verandah to bless the cakes assembled there. Once He returned to the stage, He asked for Bhajans to begin at 10.30. Prasadam was distributed. The large number of people who could not enter the Sai Kulwant Hall had darshan moving across the Gopuram gate, and accepted prasadam there. 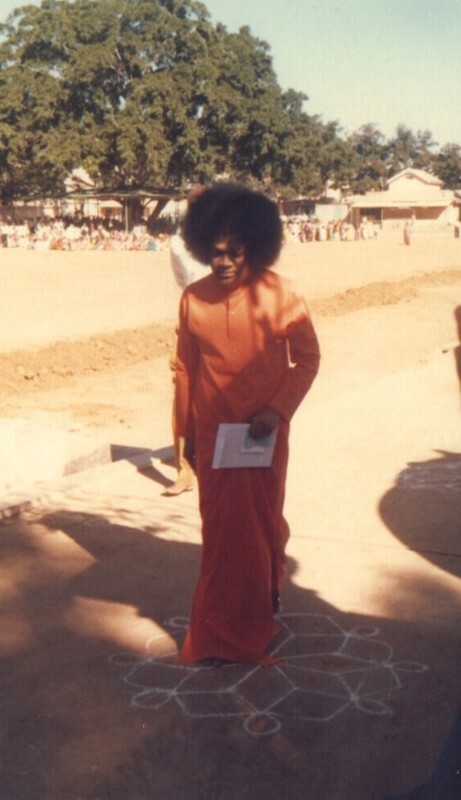 Bhagawan accepted Arati at 11 o’clock before returning to His residence. The evening programme commenced with Bhagawan arriving from His residence at 5.40 pm. Once He reached the stage, He asked Prof Anil Kumar to speak a few words in Telugu and to introduce the speakers for the evening. Sri. V. Srinivasan, All India President of the Sai Organisations spoke first, and was followed at 6.15 pm by Sri. Ajit Popat of the UK. 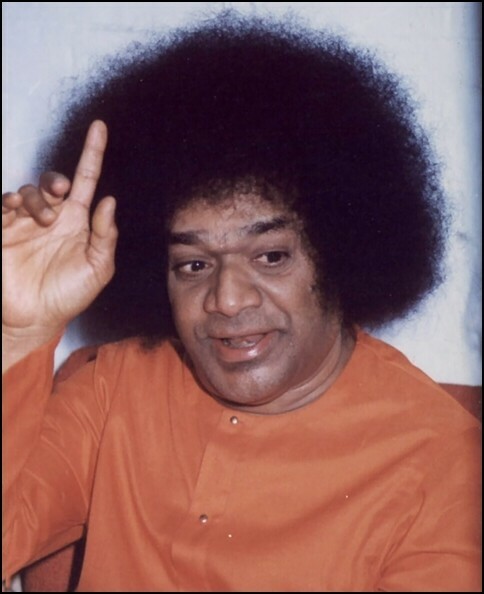 Bhagawan delivered His Birthday message at 6.55 pm, in which He declared that the Muddenahalli educational institution would come under the Sri Sathya Sai University within a year. After nearly an hour, He concluded by singing the Bhajan ‘Rama Rama Rama Sita’ and accepted Arati at 7.50 pm before returning to His residence. The 27th convocation of the Sri Sathya Sai University was scheduled for this evening. The procession from Bhagawan’s residence to the Sai Kulwant Hall led by the bands from the Anantapur campus and the Prasanthi Nilayam campus of the University began at 3.45 pm, and in a short while, Bhagawan entered the Hall in His chair clad in a maroon robe. He was flanked on the stage by the office-bearers of the University. The function proceeded in the conventional manner, with the Vice-chancellor Prof. Vishwanath Pandit presenting the graduands of the year, with the gold medal winners and recipients of PhDs being called up by Principal of the Prasanthi Nilayam campus, Prof. U. S. Rao. The convocation address was by Prof. G. Venkataraman, following which Bhagawan gave His benedictory address seated onstage for forty-five minutes at 5.20 pm. The proceedings concluded with the National Anthem just before 6.15 pm. The convocation drama presented by the students of the University got underway at the Poornachandra auditorium at seven o’clock after Bhagawan arrived there. After the drama, Swami blessed the participants with group photographs onstage before accepting Arati and retiring for the day at 8.20 pm. An announcement was made about breakfast and lunch being provided tomorrow free to all as Bhagawan’s prasadam. Last evening, Bhagawan saw the dress rehearsal of the convocation drama at the Poornachandra auditorium from 4.30 to 5.30 pm before coming to the Bhajan Hall to accept Arati after Bhajans. Today, He distributed sarees both in the morning and the evening as extended Bhajan sessions went on. In the morning, He called groups like the Primary school teachers and so on into the Bhajan Hall and distributed there, while in the evening, He went around the Sai Kulwant Hall giving sarees. He also distributed a few sarees in the Bhajan Hall. Ladies’ day at Prasanthi Nilayam began with the traditional Suprabhatam being sung by Smt. P. Susheela just before 5.30 am. The vedam chanting around the Mandir was also by the ladies. Bhagawan arrived in Sai Kulwant Hall at 9.30 am in a procession led by the girls bands of the Anantapur campus of the Sri Sathya Sai University and the Primary School, along with Vedam chanting students, as a welcome song was aired. Fifteen minutes later, when Bhagawan reached the stage, the programme for the day began with a ten-minute introduction by Mrs. Chetana Raju. The two speakers of the morning were Dr. (Mrs) Ankhi Mukherjee, former student of the Sri Sathya Sai University and Lecturer in the Universty of Oxford and Mrs. Sylvia Alden, who is a member of the Central Council of the Sai Organisation in the USA with a Masters in Special Education. After their talks, the materials kept in the centre of Sai Kulwant Hall were distributed to the needy. Solar LED lanterns, water purifiers, rugs and other items useful for the rural folk were passed on to the recipients drawn from various parts of Anantapur district. After prasadam distribution, Bhagawan accepted Arati at 11.10 before returning to His residence. In the evening, once again Bhagawan was ushered into Sai Kulwant Hall in a procession, with another welcome song played over the speakers, at 5 pm. When He reached the Mandir, He moved to the Bhajan Hall where the children from the Primary school were ready in costumes for their programme this evening. After a brief interaction with them, Swami came onstage and started the programme for the evening. Smt. Sunitha and troupe presented devotional songs for an hour and Bhagawan blessed them with clothes before the programme by the Primary School children began at 6.20 pm. Their 70 minute dance-drama brought out the glory of Sai down the ages from Krita Yuga till the present, with video projections on the back-drop adding to the narrative. Swami was very pleased with their performance and went down among them for group photographs before returning to His residence after Arati at 7.40 pm. The traditional Rathotsavam in which the idols of Rama Lakshmana Sita along with Venugopala Swami are taken from the Mandir to the Kalyanamantapam in Puttaparthi was held this morning. Bhagawan arrived at Sai Kulwant Hall after blessing the baby elephant Gita near His residence and after a darshan round in His chair, went inside a few minutes before 9.30 am. The procession led by Vedam chanting students began soon after, and as they came near the stage, Bhagawan arrived there to send them to the Gopuram gate. He then moved to the Gopuram gate to see off the procession and then returned to the Mandir and asked for Bhajans to begin a few minutes before 10 o’clock. At 10.30, He accepted Arati and returned to His residence. In the evening, Bhagawan arrived after the Bhajans began at five o’clock. He moved down the verandah in the chair and entered the Bhajan Hall from the rear door. Moving to the front of the Bhajan Hall, He sat there for a while before going on another round of darshan and returning to the Bhajan Hall to accept Arati and retire for the day.